Here are a couple of things I did wrong yesterday. First, and foremost, I believed the weather forecasters. Despite the fact that we now live in the Valley of the Sun almost five months out of the year, I still fall for it every time when the weather predictors tell me that tomorrow is going to be a chilly one. They stand there in what I can only presume is a cocktail dress and talk about the cold front that is coming through, resulting in high winds and cool temperatures. In Colorado, that means bring in small dogs from outdoors lest they blow away, and dig out your long underwear. In AZ, it apparently means the very topmost fronds of the palm trees might sway a bit and don’t even THINK about wearing a halter top. Unfortunately, I wore a sweater and jeans. To take it up a notch, I added a scarf. 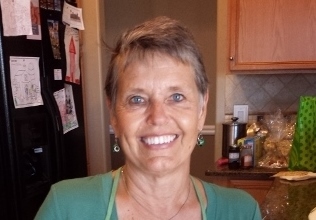 By time we drove across town and reached IKEA – our primary stop yesterday during our daily adventure – I was clawing frantically at the scarf around my neck, desperately trying to remove it before I fainted from the heat. The second thing I did wrong was, well, go to IKEA…..
I’m not an IKEA-hater. I like IKEA. 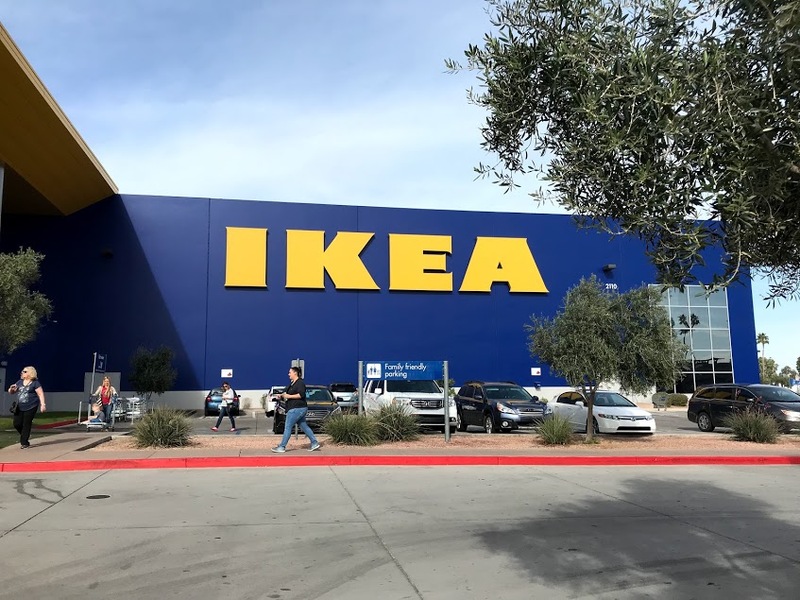 When we first bought our house here in AZ, we bought a lot of things at IKEA. The stuff’s very inexpensive. It’s just that shopping at IKEA can get very complicated. For one thing, the days when we thought it was fun to follow the arrows throughout the store and browse are long gone. The stores are huge and it takes 45 minutes to make it the distance. So now Bill figures out what he wants and where it’s located before we even enter the store. We then swim upstream, dodging people trying to steer those carts with the four wheels that all revolve 180 degrees, the result being that people are steering their carts down the aisles sideways. And then, once we located the item we wished to buy (in yesterday’s case, an adjustable desk for Bill), you have to make your way through the sea of revolving shopping carts until you reach the warehouse. The merchandise at IKEA all comes in seven or eight boxes, and has a Swedish name. 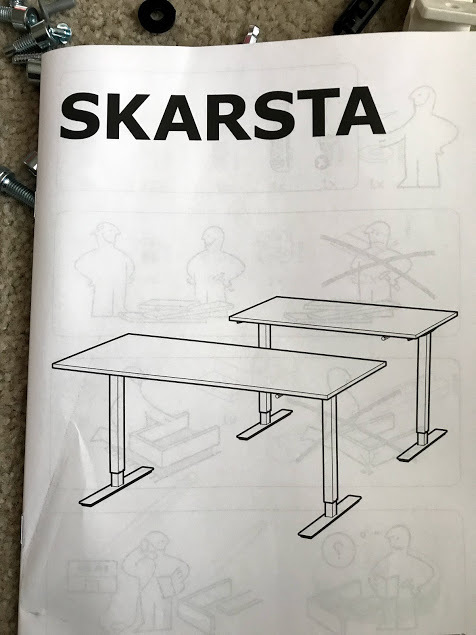 The name of the desk is…..
…..which I’m pretty sure in Swedish means You Are Stupid to Think You Can Put This Together Using That Useless L-Shaped Wrench Included in This Package. Only a handful of people in Minnesota know the truth: that IKEA is snickering behind our backs. You find your item, and then lift it onto a flatbed cart that also has those same wheels. This wouldn’t be so bad except that you can’t hold the cart still so as to set your item on it. The desk was heavy enough to require both of us to lift it, thereby leaving the cart free to take off like a bird. It took a few tries, but we were ultimately successful. By this time, I was sweating worse than the Swedish chef in a hot kitchen. 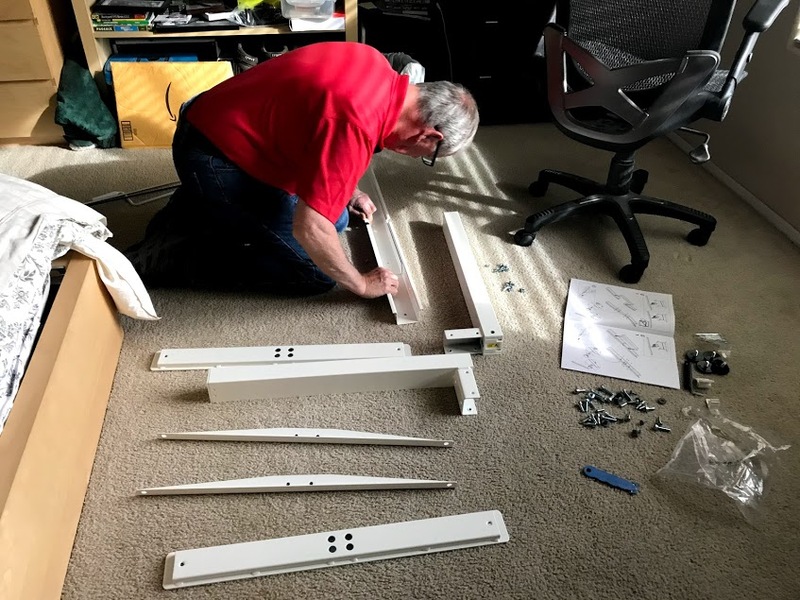 This is what it looks like to put together a piece of IKEA furniture…..
My niece Heather and her youngest, Faith, were also shopping for desks at IKEA. It’s a small world after all. Let me tell you that it appeared that Heather had full control of her cart, so maybe, just possibly, it’s me. 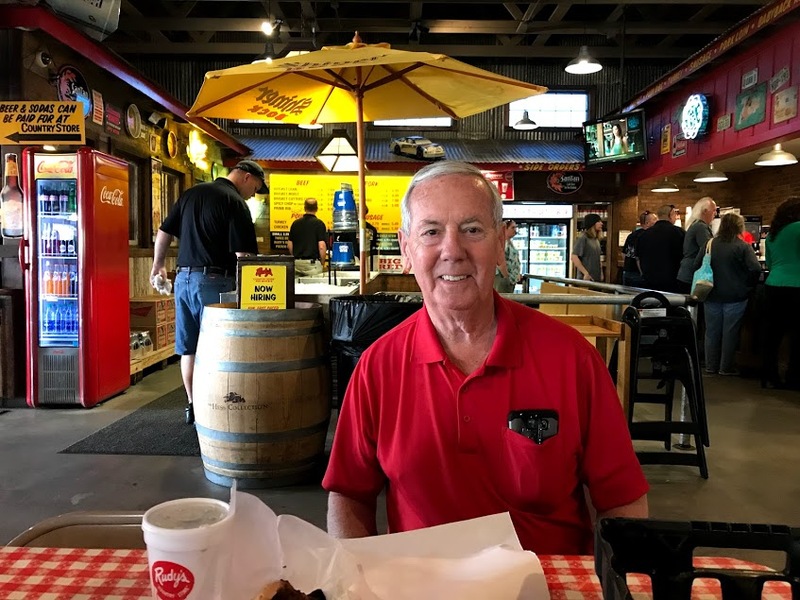 Anyway, 4-year-old Faith took one look at me and asked, “Aunt Kris, why are you wearing that scarf?” It’s a shame when a mere tyke is smarter than you…..
Any time I’m eating barbecue for lunch, the day can’t have gone that far wrong. By the way, here is the final product, and Bill didn’t use the ridiculous L-shaped wrench a single time…. The Skarsta even gets to sit in front of the window! Put your scarves in the very back of the closet. They are dead to you now. 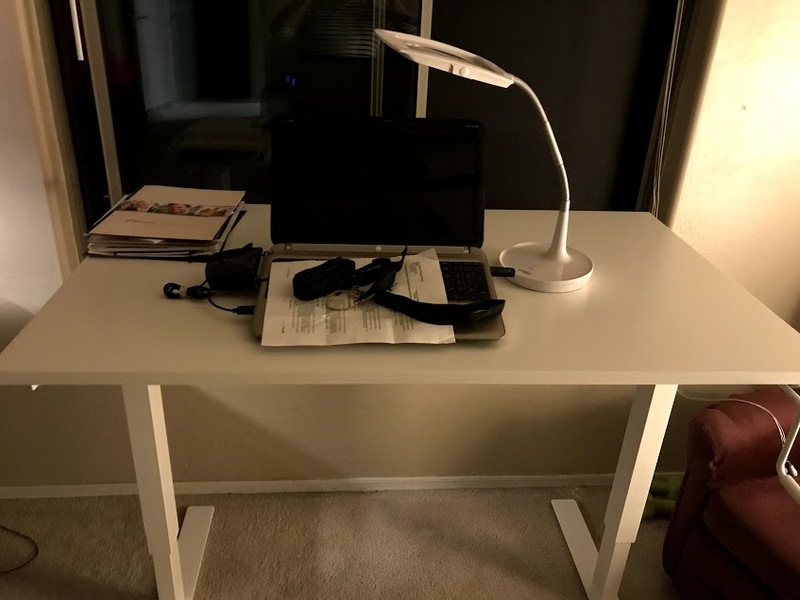 Temporary location until we move out his other desk.